I haven’t been to Cameroon yet, but I’ve included community reports from those that have. 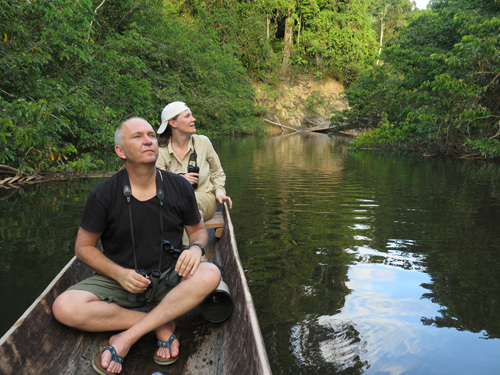 Sangha Lodge and SE Cameroon, 2017: Vladimir Dinets, 9 days & 100+ species including Bongo, Ludia Shrew, Link Rat, Giant and Red River Hogs, Water Chevrotain, Flightless Anomalure, Golden Cat and both Black and White-bellied Pangolins. 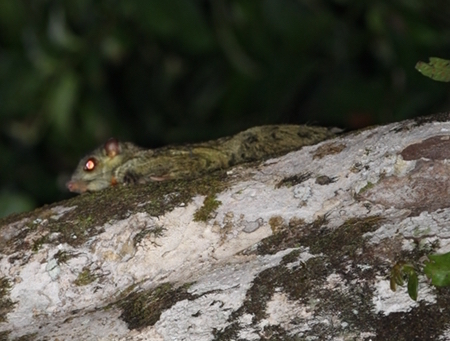 Cameroon, 2013: Rockjumper Tours, 3 weeks & 20+ species (on a birding trip) including Rusty-nosed Rat, African Pygmy Squirrel and Red-flanked Duiker. Cameroon, 2012: Rockjumper Tours, 3 weeks & 38 species (on a birding trip) including Mona and Putty-nosed Monkeys, Rusty-nosed Rat, African Pygmy Squirrel, Serval, Sand Fox, Marsh Mongoose, Red-flanked Duiker and Roan. Cameroon, 2011: Rockjumper Tours, 3 weeks & 31 species (on a birding trip) including Mona and Putty-nosed Monkeys, African Pygmy Squirrel, Beecroft’s Anomalure, Sand Fox, Marsh Mongoose, Red-flanked Duiker and Roan. Cameroon, 2010: Rockjumper Tours, 3 weeks & 35 species (on a birding trip) includingRed-cheeked Rope Squirrel, Spot-necked Otter, Roan and Red-flanked Duiker. The Congos, Cameroon and Gabon, 2009: Vladimir Dinets account of a week in each country. Species include: in Congo-Brazzaville – Black-legged Mongoose, Red-fronted Duiker; in Gabon – Northern Talapoin, Black Colobus, Red River Hog, White-collared Mongoose, Mandrill, and Cameroon – Drill, African Manatee and a swag of rodents, shrews and bats everywhere.